We are always hunting for those hair products that give you a salon finish and leave your hair looking and feeling amazing for days, but at an affordable price! ( Well I'm definitely one of these people - that's for sure!) Well look no further, I have found the next best thing to those all expensive salon brands! 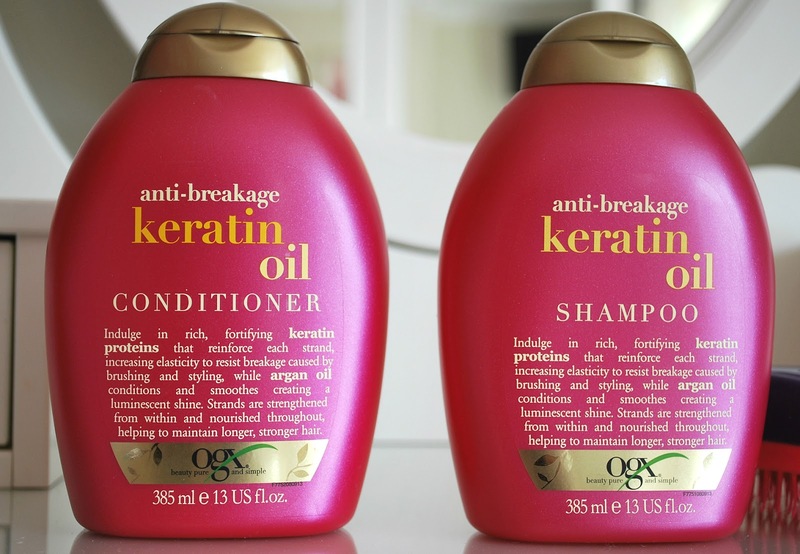 I have been using the OGX - keratin oil shampoo and conditioner for over a month now and I am so happy with the results! I am pretty sure this is not a new brand and has been available for a while now, but I have never had the urge to buy it until recently when I got recommended it and then noticed that it was often sold out in shops or very little stock - and I always take that as a good sign! So this told me I had to try it, it doesn't take much for me to purchase hair products, especially when it says it is going to make my hair stronger and prevent breakage, I'm all for that! They are £6.99 per bottle so a little more expensive than your average shampoo/conditioner but are a bargain compared to the bottles you get in a salon! As you can see on the front of the bottle it contains great ingredients including keratin proteins and argan oil which will help with shine and strengthening the hair! It is quite a thick substance and you only need a little amount - one problem I do find is the packaging, it is so difficult to get the product out of the bottle with it being so thick, especially towards the end! One tip I would suggest is using a tiny amount to cleanse the hair and then shampoo and conditioner as normal as this well help achieve a better lather! The smell is lovely, nothing to overpowering just a fresh and clean scent! When it is rinsed off it feels lovely and smooth and I leave my hair in a towel for a while before drying (otherwise it takes me forever to dry!) Every time I style my hair after using these products I am very impressed, my hair looks and feels so shiny and smooth, as if I have just walked out of a hairdressers! I feel the style stays in much longer so you don't need to use heat a lot between washes. My mam has even tried it and I noticed the difference straight away after she styled her hair, it just makes your hair look so much healthier which makes such a difference - she has now become a big fan! I feel like these products will be staying with me over summer, I can't recommend them enough! When it is time for a change I will definitely be trying more products from the OGX collection, there are so many to choose from for all hair types and containing different ingredients! 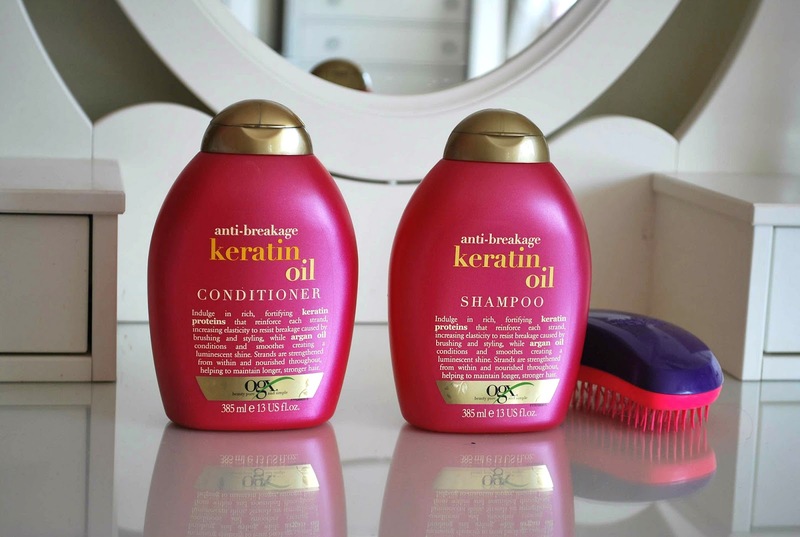 But for now these are definitely my favourite hair products!